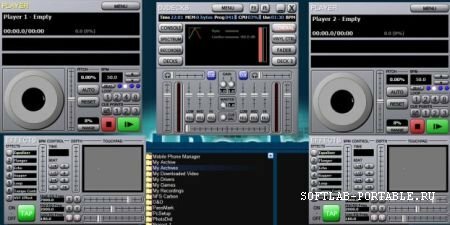 Dj Decks 0.90 Portable » SoftLab - портал portable-софта! djDecks is a computer mixing program for both beginning and professional dj's. Mix your mp3, ogg, wma, flac, wav files or audio cd's easily on any configuration. djDecks is all you need to get started and become a dj! You can pre-listen the song using headphones through the rear-out of your 3d-soundcard, with a second sound card, by splitting left and right channels or by using ASIO drivers. djDecks has a very advanced bpm detection that will help you synchronizing your songs. It's very easy to set a cue-point and start your song exactly when you want it at the position you want. Beat-matching two songs is also made easier by using the virtual record to speed a song up or down. djDecks includes a high-quality three-band equalizer per player. You can configure the cut-off frequencies of each band to create cool filtering effects. You also get an advanced effect panel with effects such as echo, flanger and gapper. It's very easy to create instant-loops up to 8 beats long with just a simple click on a button. To select your songs you can use the playlist and file browser. It loads all the id3 tags and shows the songs found based on id3 tags so you get the information displayed the way you want it, instead of by filename. djDecks can also be controlled by external hardware such as an external analog mixer, or by dj controllers such as the Vestax VCI-100, Denon HC-4500, Hercules DJ Console or the Behringer BCD-3000.